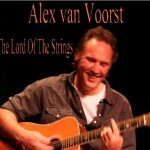 Alex van Voorst last CD is called “The Lord of the strings”. It is a full instrumental acoustic album with 14 tracks. Mostly ballades and ragtime pieces..Alex recorded the CD in Studio Olympe in France. With a little help of his friend Harry Sacksioni…. While Alex was recording in France he ended one time up in a “Tunnelvision”…Alex found the solution for this problem! He sended a MP3 file (from the piece wich gave him difficulties) to Harry Sacksioni in Holland and asked him to listen to it and to give his opinion about the song…After 30 minutes Harry gave his opinion to Alex and he could go further on and finished the CD.